Our search engine optimization core services include: Organic Search, On-Page SEO, Link Building, Keyword Research, Strategy and Activity Report. Having a proven results process ensure our clients are happy and get the most out of their websites. Every step is crucial to a website success. Most importantly is the maintenance and constant promotion and digital marketing campaigns to ensure the website and you get a return on your investment. After all, Just Marketing’s main desire is for your business to be successful and your website to bring results. 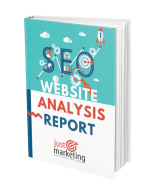 Why do I need SEO on my website? Search engine optimization (SEO) is the process of optimizing a website so that it performs well in organic search. Ranking highly for search terms which are known as keywords increases the visibility of a website and leads to a higher number of visitors to the actual website. Here some reasons Why you should start the SEO program on your website like..now!